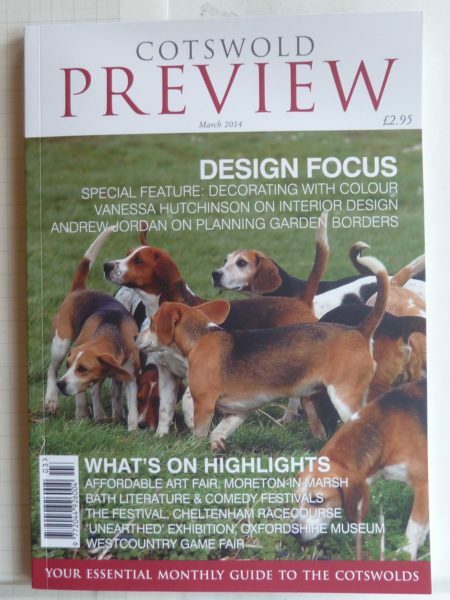 This article appears in the March issue of Cotswold Preview. Here are 10 tips to help you get the best from your garden borders. The aspect or orientation of a site will greatly affect plant choice. North- and east-facing areas will be cool and shady. Select hardy plants for this orientation, woodland plants such as hellebores and epimediums will thrive in shady spots. 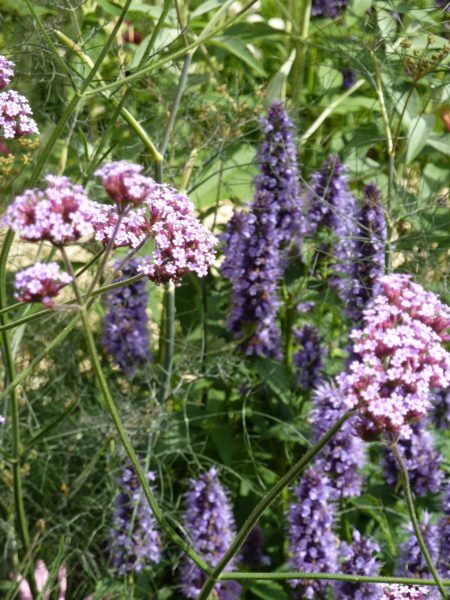 South- and west-facing areas will be the warmest and sunniest parts of a garden, here Mediterranean plants such as lavenders, cistus and rosemary will thrive. Avoid plants that like moist growing conditions as they will tend to wilt in the midday sun. Soil is the very foundation of a garden and the maintenance if its well-being is very important. A do-it-yourself soil test kit, bought from all good garden centres, will give you the pH of your soil. A reading above 7 indicates soil alkalinity, while below 7 points to an acidic soil. For good plant growth the optimum pH is 6.5. Alkaline or chalky soils will support a wide range of plants, but not garden shrubs, such as rhododendrons, camellias and azaleas, which prefer acidic soil. Always check the plant label for details. If no pH preference is listed, a neutral range will be fine. You may also want to check the texture of your soil by rubbing the soil between your fingers. Moist sandy soil will feel gritty; silt is silky, while clay soil when wet can be pressed into a sausage shape. Sandy soils will drain well and warm up quickly (suitable for herbs, alpines and drought-tolerant plants), while clay soils tend to hold more water and are cold and heavy. The easiest way to improve soil structure is to dig in well-rotted manure. Grit can also be used to improve drainage. The selection of plants should suit the style of the garden. 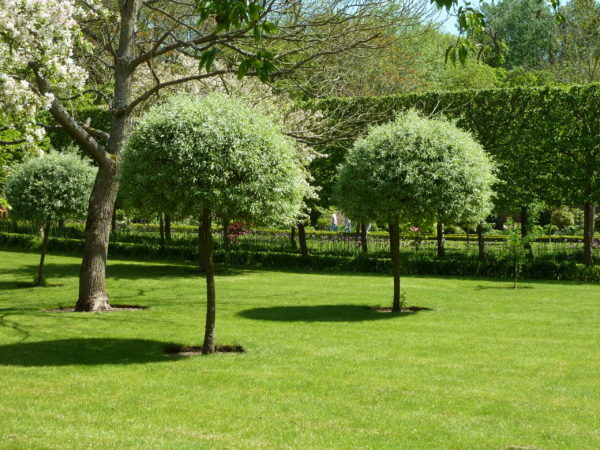 Strong shapes such as domes, spires, or rectangles that occur in the building or the design should be reflected by using clipped or strong natural forms in planting schemes, for example box or yew topiary. If going for a theme, such as a cottage garden, traditional plants such as climbing roses, drifts of herbaceous perennials and vegetables should be included in the borders. Contemporary gardens would require simple planting schemes with strong forms and textures, for example using blocks of plants such as grasses, coloured bamboos or pleached lime trees. Colours fall into two categories, “warm” or “hot” colours and “cool” colours. Hot colours such as reds and oranges are strong, stimulating and lively. Typically originating from sunny climates these plants should be placed in full sun otherwise they could appear washed-out and dull. They can be distracting, appearing to advance towards you making the space feel smaller than it actually is, so not ideal for smaller gardens. Cool colours such as blues and pale violets are subtle and restful, they appear to recede thus making a space feel larger, ideal for small gardens. They also look best in shade and show up well in evening light. Leaves last longer than flowers and tend to be considerably larger. There are a range of different shapes (oval, heart-shaped, linear, and palmate) all with margins that could be smooth, serrated or toothed. Large leaves are visible from a distance becoming strong focal points. Too many of these in a small border can make the space seem claustrophobic. These would be better placed in the foreground with smaller leaved ones in the boundaries. Examples include; Gunnera manicata, bergenias and Fatsia japonica. 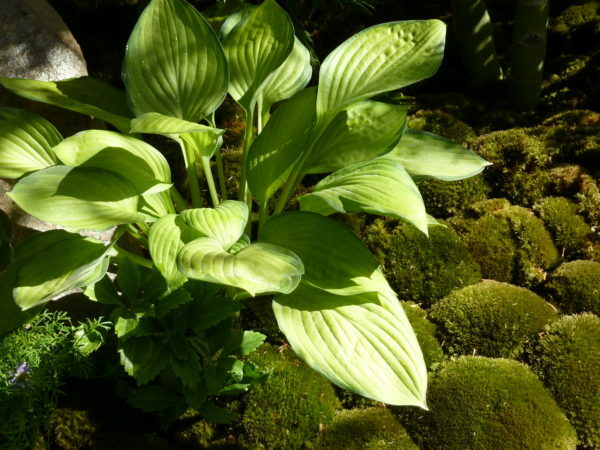 While small leaves are easy to look at, do not demand attention and give the impression of being at a greater distance than a larger leaved plant. Planting a small garden with a high proportion of this type will make the space seem larger compared to filling it with more larger leaved plants. Examples include; Hebe rakaiensis, box (Buxus sempervirens) and feather grass (Stipa tenuissima). The form of a plant is its overall shape when in leaf, this will have the greatest visual impact, more so than the leaf shape or flower colour. Strong forms such as columnar (tall and upright) and spiky are dramatic and stimulating with high energy, while domes and hummocks are restful and unimposing. Too much drama leads to a chaotic feel, while too many unimposing forms results in dull planting. High energy plants demand attention and need to be grounded with a good variety of softer forms. 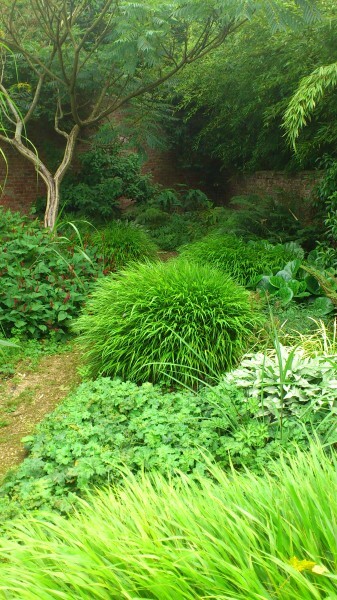 Strong forms include; phormiums, Fatsia japonica, Mahonia x media ‘Charity’ and the shuttlecock fern (Matteuccia struthiopteris), while softer forms could include clipped box, santolinas, Choisya ternata and Hebe ‘Great Orme’. Use a combination of shrubs, herbaceous plants and bulbs, the “mixed border” approach, to provide all year round interest. At the back of the border interplant some evergreen structural shrubs such as Portuguese laurel (Prunus lusitanica), Elaeagnus x ebbingei, Osmanthus x burkwooddii, along with tall herbaceous plants such as achilleas, aconitums, veronicastrums and phlomis. Select herbaceous plants with a long flowering season for the middle of the border, for example; astrantias, eryngiums, salvias, paeonies and penstemons. While for the front of the border use low-growing herbaceous plants, some of which should be evergreen. Some examples include; hardy geraniums, heucheras, bergenias and epimediums. Planting bulbs between the herbaceous perennials will help to disguise areas of bare soil during winter and early spring. 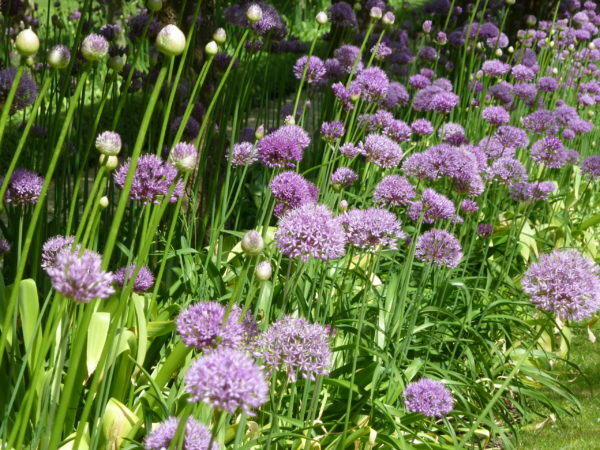 Bulbs for spring include Narcissus ‘Thalia’, Allium hollandicum ‘Purple Sensation’ and tulips. When planning your planting scheme it is important to consider how much time will be available to look after the garden. Always check the plant label to make sure all the plants you choose have the same growing needs (sun required, water and the soil pH), and that they won’t require more care and attention than you can actually provide. If you have little time select a limited range of relatively quick-growing, non-invasive plants that do not self-seed or require staking. Plant as many evergreen plants as possible as they will very likely only require pruning once they start to outgrow their allotted space. Include evergreen plants at the front of the border, to provide ground cover thus helping to reduce weed growth. Grasses such as Calamagrostis x acutiflora ‘Karl Foerster’, Anemanthele lessoniana and miscanthus species will provide interesting forms throughout the seasons and are also low maintenance. Rather than have one of everything (a common mistake), try to limit the number of different types of plants used in the border. Many plants look great when they are planted in threes or an odd number. 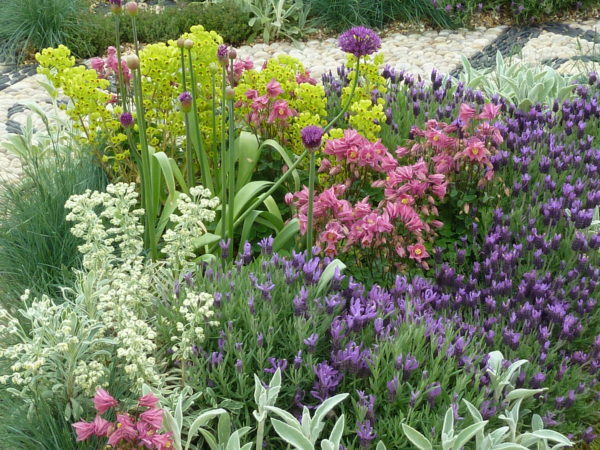 It is better to group plants together and, if you have the space, to repeat the grouping elsewhere in the border or garden, which provides a satisfactory sense of rhythm within the planting. Refer to plant labels and reference books for a guide to planting distances. Remember don’t completely cram your garden from the very start. Include ‘fillers’ to fill the gaps in between permanent planting as it matures. 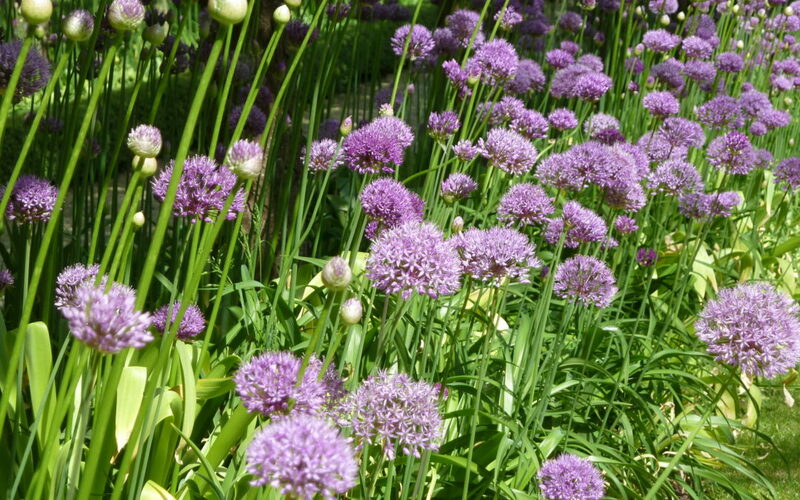 Fillers include; bulbs, annuals, biennials or tender perennials.